And last is my card for Cuttlebug Be Inspired #16. The challenge was to use distressing as part of your texture on the card. I embossed the background patterened paper with the "Swiss Dots" embossing folder, and then sanded over the top of it to really bring those dots out. After layering the rest of the paper on the card, I used the "I Love You" embossing folder and embossed the sentiment on to a block of heart patterned paper. This one took a little more precision sanding in order to make that sentiment really stand out. I then cut the sentiment out using the square die from the "Stamps" set, and added some finishing touches! 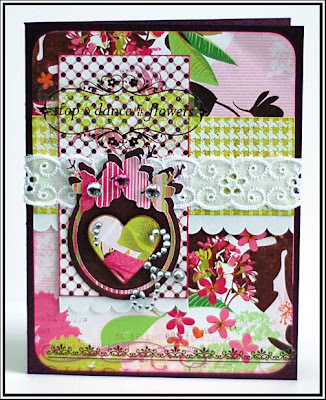 This card uses Basic Grey "Two Scoops" and Sassafras "Hog Heaven" papers, and LOTS of rhinestones. Love it! So, last night I looked at my driver's license for some reason and about had a heart attack. My license expired on my birthday!! Totally wasn't aware of that fact! Thankfully, Montana has a 90 grace period when it comes to retesting...but I would have gotten a pretty hefty ticket had I been pulled over with an expired license. 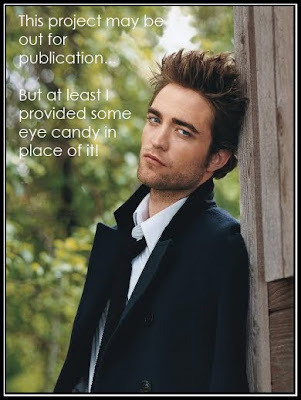 (Thankfully I am a law abiding citizen...hee hee!) Montana has now taken to the ultra close-up, didn't even get all my hair in the shot, type of driver's license photos. Honestly...if I had looked up in the tiniest bit, you would have been able to see right up my nose. And I have to keep this license until the year 2017. Here is hoping I don't change much in the next 8 years...tee hee! And in case you wanted to know....I am 61 inches tall without shoes on. Oh, and a little reminder. 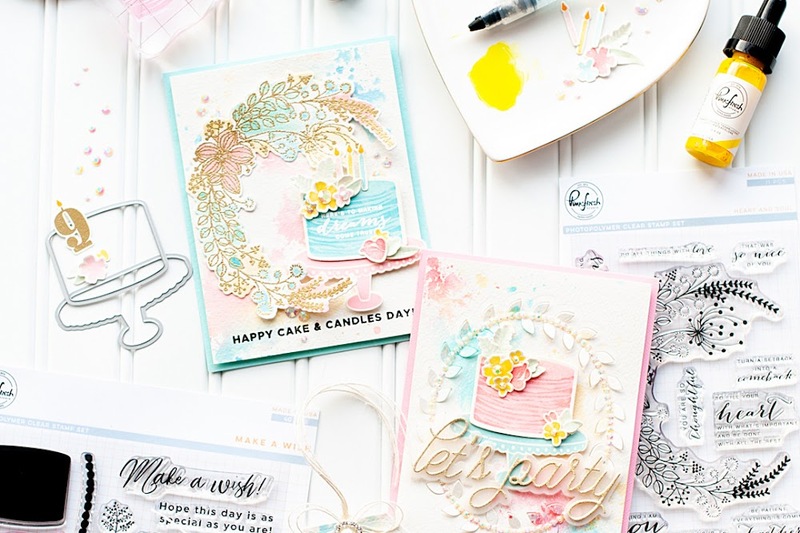 You still have a chance to get a card published in the September issue of CardMaker Magazine! 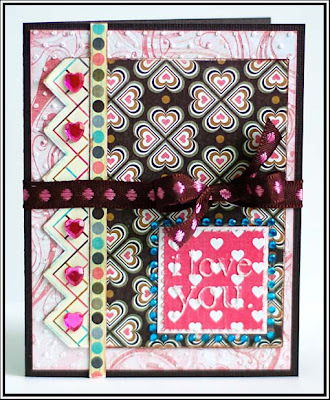 Do a card based on sketch 100 at the CPS blog, and load it up into the contest's flikr gallery. The deadline is the end of this week sometime...check the blog to get the details you need! Have a great rest of your Tuesday! Amazing Lea! The colors are simply fabulous. So many colors, they all fit well! I like your banner, so cute! That cupcake looks yummy! Sounds good right now with a cup of cafe! How far can look up someone's nose that is only 5-foot 1-inch tall? I thought we made you bigger than that...haha. You crack me up! Wow! You've just been busy busy busy!!! Love them all. The colors are just too fun! Ok, now I have to do a Mojo Monday. I am subscribed to them but never did one. Or, maybe one, who knows :) The CB challenge seems fun too. I have a few blog buddies who does it on a regular basis. I should participate. It'll make me sure my CB more. LOVELY stuff, gal!! OK. You just totally ROCKED these sketches! What an awesome sense of style you have! Great job!!! Gorgeous cards!!!! I especially love that first one!!! The colors are so fun!!! Love them all ... especially the first one ... rockin' creations. spectacular cards...great choices of dp's and embellies! Oh, I love these Lea! That first one knocks my socks off with it's bold colors and cute little mushroom! Lea, thank you so much for the lovely comment in my card. Your cards are gorgeous! I love them all. You did a fabulous job! Thank you for sharing! Lea, these are absolutely stunning, each and every one of them! 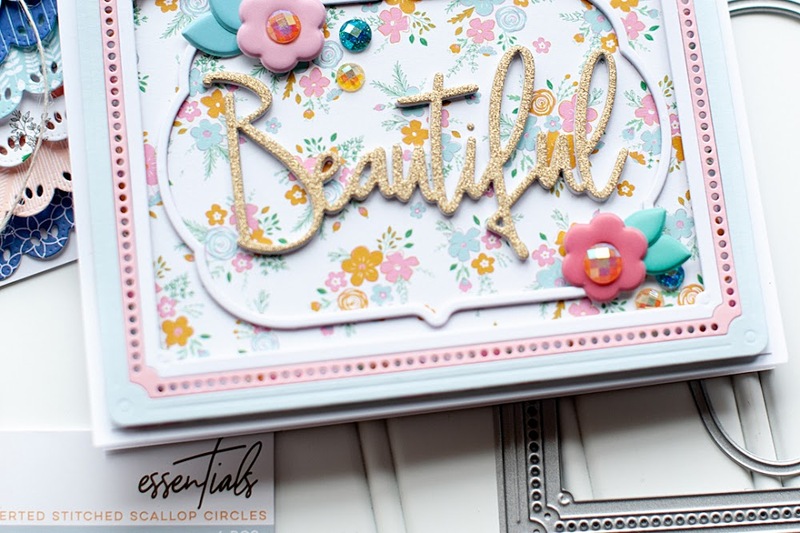 Especially love your distressed card for Cuttlebug Challenges, truly beautiful! So much detail and sanded to perfection! Your dad's comment made me chuckle! He sounds a sweetheart! Wow! Beautiful! I love your style. The cards you made are beautiful!!! Your cards are fabulous! As always!! All our your cards are awesome! Super creative designs. Wow! you have some fabulous cards on your blog, Thank-you for taking the time to visit and leave a comment on mine, I will be back for a longer look round when there is some more time. WOW, Lea, these are all so gorgeous!!! Absolutely amazing cards!!! I am totally loving all the color in your cards today!!! Absolutely gorgeous!!! Love what you did with the cuttlebug!! I am going to have to get myself one of those one day!!! Hope your day has been awesome!! thats a whole lotta gorgeous!!! Gorgeous cards! I love the new Colorbok friendly forest line. I love these cards! But I especially love the colours in the first one - incredible! oh wow, wow Lea! these are amazing creations. the new Colorbok line screams "lea, work with me" you are so incredible!!! Love your cards!!! I passed by the forest line so many times at Michaels I will need to get it next time. Wowee! Your cards are amazing! Love em all! wow! you pack so much detail into one card! amazing! such amazing cards, i love the ribbon you have used on the first card, very fun and the mushroom image. CPS 103 & some fun reposts! 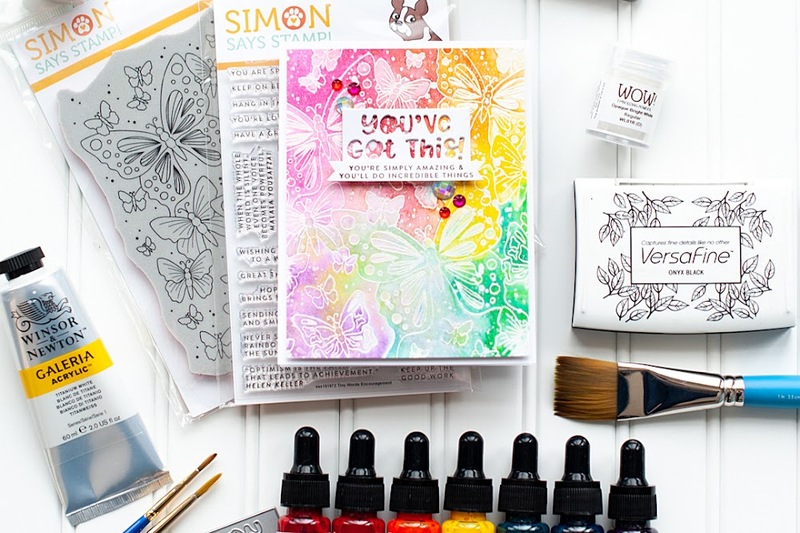 CPS Blog Hop Giveaway Winner & more! 2S4U & Friends 'Til The End..